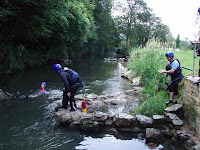 Frome Canoe Club is based at Market Yard in the centre of Frome and meet weekly for training sessions on Wednesday evenings between 7pm and 9pm during the spring and summer months. We are based at Market Yard in the centre of Frome and meet weekly for training sessions on Wednesday evenings between 7pm and 9pm during the spring and summer months. The club has a good programme of events and white water kayaking is one of the popular activities that members enjoy. We have a strong slalom focus and compete in many events during the year. We also host a National event during the summer. During the year we run courses to help paddlers improve their skills. Young people can enroll on the Paddle Power Programme. Adults can take One, Two and Three Star awards. Pool sessions have stopped now. We're back on the river w/b 15th April. River Avon (Bath to Saltford) - 28th April. Paddle Fest - 11th and 12th May. Info here. YPC - next meeting is Monday 20th May. Choose your design and order from No Limitz. Pictures from the Frome trip now in the Gallery. The rota for the Market Yard sessions is here. We welcome all offers of help! Just sign up in the spaces for the sessions you can do! Contact Frome Canoe Club Secretary Pam Dixon 07740 472982, email Pam. Frome Canoe Club is Clubmark accredited and is a Paddle-Ability Top Club. The Club has also adopted a smokefree policy. For further details about the Club, click Membership. Canoeing and kayaking are "Assumed Risk" - "Water Contact Sports" that may carry attendant risks.Participants should be aware of and accept these risks, and be responsible for their own action and involvement.